At the beginning of our second reading, taken from 1 Peter, the author exhorts those he addresses to “Sanctify Christ as Lord in your hearts” (1 Pet 3:15). Our entire epistle reading is taken from a section of 1 Peter dedicated to the role of suffering in the lives of Christians. While this is a hard saying, it is often through our sufferings that we proclaim Christ. According to theologian Douglas Harink, “In an often hostile world, within often unjust and oppressive political and social systems, the messianic people proclaim the gospel by taking up the cruciform way of the Messiah.” As a result, Christian proclamation of Christ “often takes the form of suffering" (Brazos Theological Commentary on the Bible: 1 & 2 Peter 93). Even when suffering, a Christian (i.e., one who has sanctified Christ as Lord in her heart) remains a person of hope who is willing and able to explain the reason for her hope: Jesus Christ. Considering Jesus’ teaching in the Beatitudes (see Matthew 5:10), a Christian might say that it is blessed to suffer for doing good. In the end, even if it only amounts to suffering wrongs patiently, which is one of the Spiritual Works of Mercy, is perhaps the most telling sign that someone has sanctified Christ as Lord in her heart. According to St. Paul, patience and kindness are fruits of the Spirit (Galatians 5:22). Love, too, is a fruit of the Holy Spirit (Galatians 5:22). Jesus tells his disciples he will ask the Father to send “another Advocate” (John 14:16) The first Advocate, of course, is Jesus himself. The Greek word for “Advocate” in this verse is Parakletos. A Parakletos is someone who stands beside you to help you, to plead your cause as an intercessor. The Parakletos Jesus promises the Father will send, will be with them always (John 14:16), unlike Jesus himself, who will die, rise, and ascend to Father before returning in glory. Jesus sends the Spirit in order not to abandon his disciples. The Lord does not make us children of the Father only to render us orphans. As New Testament scholar Luke Timothy Johnson asserted, “The Holy Spirit is the mode of Jesus’ resurrection presence to the world” (Living Jesus: Learning the Heart of the Gospel 15). Jesus tells his disciples that not only will the Parakletos the Father sends remain with them, but he will be “in” them. Ultimately, they will realize that Jesus is in his Father and that they are in Jesus and he is in them (John 14:20). The way Jesus is “in” us is by the power of the Holy Spirit. We call the ways Jesus comes to be in us by the power of the Spirit sacraments, that is, sacred mysteries. There is one sacrament that is corresponds to the Spirit in perhaps the most explicit way: Confirmation. We see that Confirmation completes Baptism in our first reading, taken from the Acts of the Apostles, when Philip, one of the seven we heard about last week, who were set apart by the Apostles in Jerusalem, proclaimed the Gospel and baptized those who came to faith in Christ. Since her earliest centuries, the Church has understood the setting apart of the seven as the apostolic foundation of the diaconate (Acts 6:3). Stephen and Philip, who are mentioned as the first two of the seven, are heard more from in Acts (Acts 6:5). Stephen was the Church’s first martyr- stoned to death for preaching the Gospel (Acts 7:54-60). Philip, meanwhile, headed north to the region and city of Samaria. There, like Stephen, he preached the Gospel. But Philip also healed the sick and cast out evil spirits in Jesus’ name. He also baptized those who, through his preaching, put their faith in Christ (Acts 8:5-7). After hearing that people came to faith and were baptized in Samaria, the Apostles sent Peter and John to confer upon them the gift of the Holy Spirit by the laying on of hands (Acts 8:17). Just as we can see the setting apart of the seven men as the apostolic basis of deacons, we understand this as a key biblical witness for the Sacrament of Confirmation, including the bishop being the ordinary minister of this sacrament. 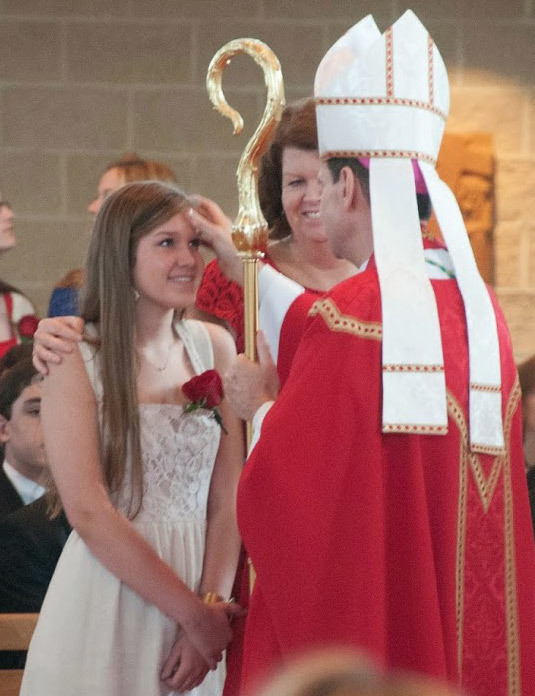 There are those among us who are preparing to receive the Sacrament of Confirmation. Our young men and women will be confirmed here at St. Olaf in a few weeks. Seven of our adult brothers and sisters will be confirmed at the Cathedral the week prior. Just as the Apostles laid hands on those baptized by Philip in ancient Samaria to impart to them the Holy Spirit they had received on the first Christian Pentecost, Bishop Oscar, who, as a bishop, is a Successor of the Apostles, will lay hands on our sisters and brothers, thus completing their Baptism, confirming their baptismal identity as daughters and sons of the Father, through Christ, by the power of the Holy Spirit. It may well be the case that Philip fled the persecution by going to Samaria. If so, suffering and persecution did not keep Philip from doing what all Christians are called to do: bear witness to Christ in word and deed. We bear witness not just in the midst of suffering, but often by it and through it. Like the other six set with whom he was chosen by the Jerusalem community, Philip was not filled with the Holy Spirit by being set apart by the Apostles. He was set apart, the Scripture informs us, because, like his six brothers, he was “filled with the Spirit and wisdom” (Acts 6:3). Far from any kind of imagined “graduation,” the Sacrament of Confirmation is empowerment for mission. So, we might consider it a commencement, but only if we’re clear that “commencement” means beginning, not end. "Dreams have never made my bed"